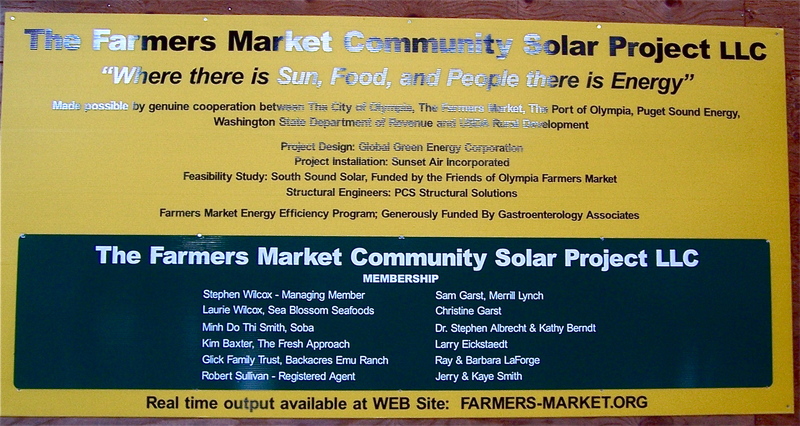 This community solar project was made possible by cooperation among local solar businesses. The Friends provided the funds for the feasibility study which was conducted by South Sound Solar. Project design was performed by Global Green Energy Corp. Installation was completed by Sunset Air. The system is grid-tied and produces 37 kW of solar electricity. It includes 192 Washington State-made solar panels combined with 8 Washington State-assembled inverters. As a “Community Solar Project” with WA-made components, this system not only defrays The Markets’ utility costs, but qualifies for double production incentives by rewarding the investors at $1.08 for each kWh this system generates.